Dizzy decade -- From riches to rags to . . . ? 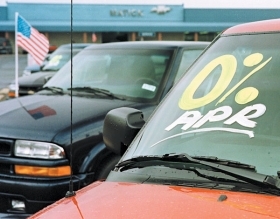 After the terrorist attacks of 2001, an incentive push by General Motors got car sales moving. But by the end of the decade, automakers struggled to kick the incentive habit -- and the harsh toll it takes on the bottom line. It was supposed to be the decade of prosperity. At the turn of 2000, the Dow had just soared past 11,000 -- fresh off a 21 percent rise in less than one year. U.S. light-vehicle sales were the highest in history, nearly cracking 17 million units. GM's stock was at $72 a share, and its market share was 29.4 percent. Gasoline was $1.26 a gallon, and everybody was pushing highly profitable SUVs. Said Pierre Gagnon, Mitsubishi America's COO: "It's a great time to be in the auto industry." It didn't quite end that way. A decade later, it is an industry that is repositioned, recast and retooled -- mostly in the last two years. The Big 3 became the Detroit 3. Suppliers went out of business. China became a power player. The UAW gave back. And two car companies went bankrupt. It was nothing short of historic. It was anything but a prosperous ending. As the decade closes, here's a look back at 10 things that shaped a momentous decade in the industry. As America reeled in the wake of the Sept. 11, 2001, terrorist attacks, General Motors rolled out its Keep America Rolling promotion aimed at shellshocked consumers. The centerpiece was 0 percent financing for car loans -- and it proved wildly successful. The annual selling rate for October 2001 was a scorching 21 million units, as GM's competitors followed suit. Critics said the incentive binge eventually would damage brand equity and trap automakers in a low-margin, high-volume game. GM CEO Rick Wagoner responded that the strategy suited GM, which needed high output to meet fixed costs. For a few years, the incentive game worked. But by the latter part of the decade, automakers turned to value pricing, cutting stickers to more closely match transaction prices. The incentive game had played out. Early in the decade, it appeared that the digital world was going to revolutionize automotive retailing. It did, but not in the way that Internet entrepreneurs expected. Initially, companies such as Autobytel, AutoWeb and CarsDirect pushed for direct Web vehicle sales -- but dealers pushed back and held on to their business. State franchise laws were an asset, but so was consumers' need to trade in cars, test drive them and have them serviced. But the Internet still had a profound effect on retailing, as consumers increasingly did initial shopping on sites such as Kelley's kbb.com and edmunds.com, finding it easy to compare prices, features and specs. Consumers coming into showrooms today know what they want and what its market value is. If anything summed up the trials of automotive suppliers in the decade, it was the seemingly endless bankruptcy of Delphi Corp. In October 2005, General Motors' former parts unit entered Chapter 11 reorganization, where it languished for four years. Likewise, much of the supplier segment has been in U.S. Bankruptcy Court this decade. The list includes big old-line suppliers such as Dana Corp., Dura Automotive Systems, Tower Automotive Inc., Federal-Mogul Corp., Lear Corp., Collins & Aikman Corp. and Ford's spinoff, Visteon Corp.
Those that haven't entered bankruptcy have had to contend with extreme price pressure from hard-pressed customers like GM, aggressive Chinese competitors, increasing demands for quality upgrades -- and, this year, steep production cuts. For autos, the price of gasoline is like wind at a sailing regatta -- it determines strategy and tactics, winners and losers. The decade started with SUV sales booming and regular gasoline at a national average of $1.26 a gallon. Ten years later, hybrids are gathering momentum, many automakers are planning electrics, crossovers are hot, and SUVs are yesterday's news. Why? Because gasoline peaked at $4.05 in 2008 and was still a pricey $2.56 in December 2009. Expect many more changes. This year the Obama administration mandated fleet averages of 35.5 mpg for the 2016 model year. 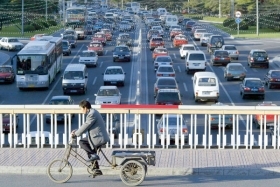 From a global perspective, perhaps the biggest automotive story of the decade was the high-speed change of China from a bicycle culture to a voracious consumer -- and increasingly aggressive producer -- of motor vehicles. Zhejiang Geely Holding Group was founded in 1997. Just 12 years later it was Ford Motor Co.'s choice to buy proud Volvo Cars. Geely's ascendancy underscores China's astonishing coming of age as a vast new market and a tough competitor to U.S. suppliers for hundreds of parts, from aluminum wheels to electronics. General Motors, Ford and most other global automakers have thriving operations in China. But China's growth has rocked parts makers. Suppliers from Delphi on down have lost business to China-made parts, outsourced parts to China, launched their own operations in China, or all three. This has cut costs for automakers and consumers -- but has helped close many U.S. factories. 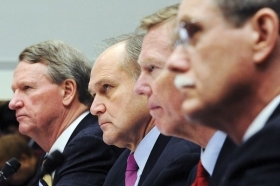 CEOs of the Detroit 3 -- from left, Rick Wagoner of General Motors, Bob Nardelli of Chrysler and Alan Mulally of Ford -- and UAW President Ron Gettelfinger traveled to Washington, hats in hand, in December 2008 and got scolded by critics in Congress. Their Chapter 11 bankruptcies gave General Motors Co. and the Chrysler Group a second chance. But for more than 2,000 of their dealerships, the bankruptcies were devastating. The stores were cut loose, although lobbying in Washington later produced a law that provides some hope of restoration through arbitration. After decades of market-share decline, the two automakers had too many dealerships. In recent years, the companies could have reduced their rosters with systematic buyouts. Instead, that can was kicked down the road until dealers were left subject to the drastic powers of U.S. bankruptcy law. On Nov. 23, 2000, when a 47-year-old engineer from Stuttgart took the top job at Chrysler, it was the start of an influential decade for overseas executives in America. Dieter Zetsche left his mark at Chrysler's headquarters and brought Wolfgang Bernhard with him. Both would return to Germany before the roof fell in. Italian-Canadian Sergio Marchionne resurrected an imploding Fiat after taking the top job in 2004 and now fills Zetsche's old role at Chrysler. Carlos Ghosn, a Lebanese-Brazilian, turned Nissan upside down early in the decade, before adding Renault to his portfolio, and took a run at acquiring 20 percent of GM in 2006. And a Swiss-born product guy, who used to be a high-ranking exec at Chrysler and Ford, had an impact on Detroit after he came to GM in 2001. Bob Lutz was 69 then. Ten years later, he's an adviser to GM's chairman. In 2000, the Detroit 3 were still the Big 3. By decade's end, with General Motors and Chrysler fresh out of taxpayer-funded bankruptcy restructurings, the Big 3 moniker had been downscaled to Detroit 3. The meltdown of Chrysler and GM capped an astonishing decade-long decline by the Detroit automakers. Beginning with the Explorer-Firestone crisis in 2000, Ford also foundered -- though the surprise choice of Alan Mulally as CEO has Ford in relatively good shape going into 2010. The Detroit automakers' collective U.S. market share plunged -- from 68.5 percent at the end of 1999 to 44.5 percent today. Meanwhile, Toyota became the world's largest and most profitable automaker. U.S. share more than doubled, to 16.8 percent today. Cracks are now showing with recent quality problems and overexpansion. But for most of the decade, Toyota sparkled. Along with the Detroit automakers, it was a decade of decline for the UAW. Membership plunged, and union leaders accepted landmark concessions. Two-tier wages? Check. Taking responsibility for retiree health care? Check. Cancel the Jobs Bank? Check. As the decade wound down, hourly workers at General Motors, Ford and Chrysler received one buyout offer after another. As GM and Chrysler spiraled into bankruptcy, the union provided more givebacks -- but gained something in return. Today, UAW retiree health care trusts own 55 percent of Chrysler and 17.5 percent of GM. As if the industry wasn't dealing with enough -- CAFE, pricing pressures, increased competition -- along came a global credit crisis and the worst recession since the Depression. It devastated the industry in 2008 and 2009. Vehicle sales imploded, forcing General Motors and Chrysler Group into bankruptcy reorganization in the spring of 2009. Unlike the earlier four-year bankruptcy of supplier Delphi, the automakers rushed through quick-rinse restructurings funded by taxpayers. They dumped dealers and employees, shed brands and wrested concessions from the UAW. In the end, an Italian company ran Chrysler, the U.S. government ran GM, brands died and a world was reshaped. Where do we go from here? Anybody's guess. Here's a prediction: The next 10 years probably will be even more dramatic.